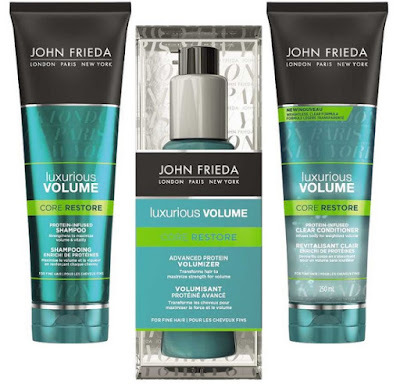 The John Freida Luxurious Volume Core Restore collection - offers a new level of touchable volume! Sick of the usual volumizing products that leave hair feeling stiff and weighed down" That's why John Freida Luxurious Volume Core Restore has a formula which uses the Protein-Strength Complex - with core reinforcing actives, that penetrate and strengthen hair from within - to transform fine, limp hair by boosting volume while maintaining a soft, natural hair feel! Luxurious Volume Core Restore Protein-Infused Shampoo - 250ml - $10.97 - strengthens to maximize volume and vitality and brings protein-deficient hair into balance by unlocking a new level of touchable volume. Luxurious Volume Core Restore Protein-Infused Clear Conditioner - 250ml - $10.97 - with an innovative clear formula that detangles and weightlessly absorbs into hair without coating it to infuse hair with body and weightless volume. Luxurious Volume Core Restore Advanced Protein Volumizer - 60ml - $12.99 - with heat-activated technology that protects and strengthens strands with every use.